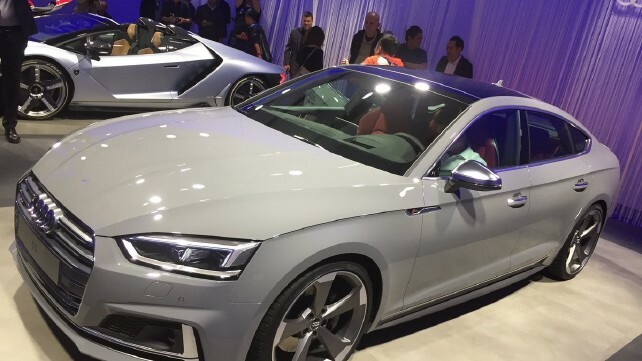 Audi has taken the wraps off their new A5 and S5 Sportback at the Paris Motor Show. This is the first public appearance of the cars that were recently revealed through images. Both the cars highlight the Sportback hallmark design like an extended rear section and sloped roofline. They also get a forward sloping stance that defines the Sportback body style. Otherwise nothing much has changed in comparison to the standard A5 coupe. The muscular styling with prominent body creases is carried over. Even for the interior, the dashboard is identical to the A5 with digital instruments and a MMI infotainment screen in the centre. Upholstery and equipment wise also the Sportbacks get a similar treatment. We can expect the headroom to reduce a bit due to the sloping roofline in these cars. On the powertrain front for the A5 Sportback, there is a 188bhp 2.0-litre TFSI petrol mill. For the oil-burner, there is a wide choice of engine options including 2.0-litre and 3.0-litre units in various power outputs from 187bhp to 282bhp. Transmission options include a six-speed manual and a seven or eight-speed automatic gearbox. The S5 Sportback comes powered by a 3.0-litre V6 turbo petrol unit with 349bhp of power and 500Nm of torque on tap. While the rest of the range is front-wheel drive, the S5 is equipped with quattro pushing the fastback from 0-100kmph in 4.7 seconds. While the cars have made their debut at the Show, they will go on sale in the UK at the start of 2017. Also, their India launch might not be far away as their Indian counterpart has already brought the cars in India for homologation. Their introduction in the Indian market will be through CBU route by early 2017.